He's probably one of the best music producers of our time, though not everybody really knows who Gramatik is. Maybe it's because, from his childhood in Slovenia to his U.S. exile, Denis Jašarević strayed from the conventional path to stardom. The artist's success is based on facts, not lucky stars. Here's our well-calculated portrait. The end of a TV show is always traumatic. Breaking Bad? Tough. Dexter? Surprising. Lost? A shock. But at the end of the day, it’s the screenwriters who mess everything up. “How can such a great show just end like that?” This is the philosophical rant that Gramatik has just started at 2 o’clock in the morning, backstage at the musical festival Papillons de Nuit, somewhere in Normandy. Usually, you get one or two hours to defend your opinion. Gramatik only gets a few minutes. Nina, his partner, holds up two fingers to show how little time there is left before the show. “It’s time to go,” she says calmly. The Slovenian artist makes his way front-stage where 25 000 people are waiting for him, eager to dance. No big deal. After an hour-long show, Gramatik doesn’t forget the conversation. He raises his hands in the air, switches off the MIDI-pad, and walks off nonchalantly. As if nothing happened in this last hour, he starts talking about the “pseudo-demons” that run corporations and, in turn, even control the most popular TV shows. Gramatik himself has been writing his own script since about the age of 14. He has always done what he’s wanted to; from mixing different types of music, to projecting mathematical formulas on stage, to talking about Game of Thrones 30 seconds before a gig. 15 albums later, everything seems to be in its right place. One of his funkiest tracks from the Street Bangerz series, "Muy Tranquilo", has over 8 million views on Youtube, he's won two Beatport Music Awards, and he's on his way to start scoring films. But these days, the 32-year-old artist is back on tour in Europe to showcase his newest releases, which may become an album next year. The first track is a new single called "Recovery", which features Eric Krasno, an American Grammy-winning artist. And as usual, Denis Jašarević [NB. 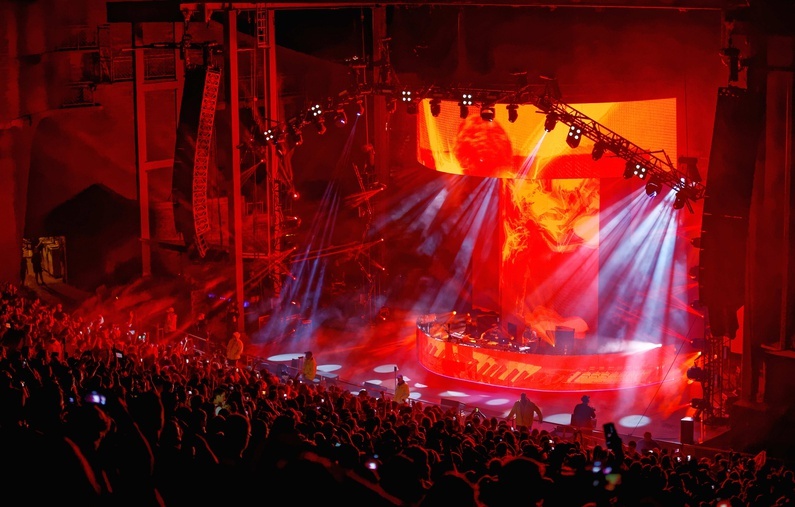 the artist's real name] always puts a bit of himself in the songs: he just recovered from a leg injury that meant he had to take a break from his intense touring schedule. It’s early June, and Denis seems to have fully recovered. His short black windbreaker, black cap and sunglasses show the image of a man who is fit and strong–ready to put on a show. Sat in a cold hotel restaurant in Lower Normandy, the Slovenian artist explains the relationship between his life and music: "I'm not the kind of person that can separate myself and my view of the world from my music. It's me who is making that. I usually name a song after something important to me in order to shed light on it." After a little digging, it is clear to see that in his latest album Epigram, which came out in March 2016, Gramatik did just that. The same "pseudo-demons" that taint TV shows are actually synonymous with "Corporate Demons", one the songs in the album. "The song was about the idea of the corporate world being run by pseudo-demons. They will destroy thousands of lives just by making a decision in an office somewhere on Wall Street, and they sleep like babies. That's a very demon-like attribute to have for a human being." Denis' world is not one filled with rainbows, unicorns and glitter. He refuses to live in ignorance. His world is bleak, but honest; something reflected explicitly in his music and choice of song titles. Even behind his dark sunglasses, nothing is shady about him. The cynic at heart continues to unveil his view of the world: "A lot of problems in the world stem from the fact that nobody has any idea what they're talking about." But although it is easy to slide into sardonic banter with the Slovenian artist, there is another side to him. With a glimmer of hope, he continues: "I think the most important thing for us to survive and become a prosperous civilisation is emotional intelligence... and basing everything on logic and reason." What logic and reason translate to is science. "I always say that if I were smart enough to be a scientist, that's what I would want to be. So music is the second best thing for me because I can actually do it," Gramatik adds modestly. Quantum physics, theoretical physics, and astronomy litter the artist's Twitter account. Music and science are inseparable. 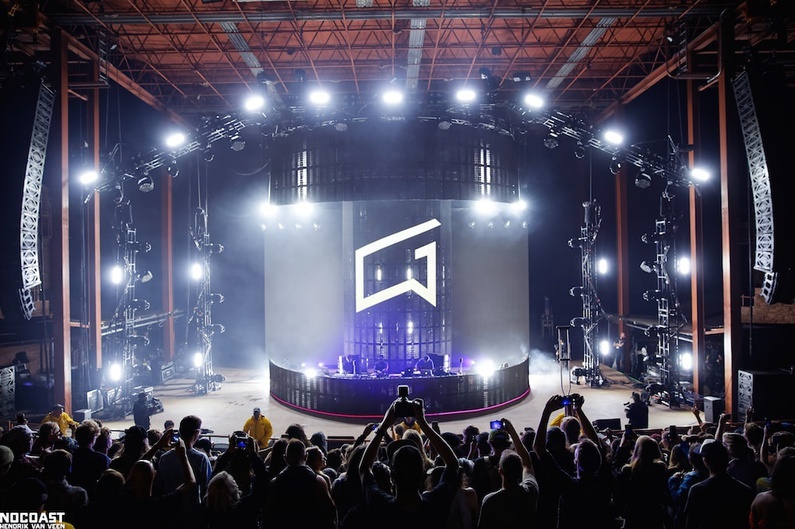 Like a mirror image of Einstein, who would have been a violinist had he not been known for his work as a physicist, Gramatik is inspired by both. Epigram, his latest album, is full of scientific references. "Room 3327", for example, alludes to the New York hotel room in which Nikola Tesla spent the last ten years of his life. He also references the founder of Bitcoin, Satoshi Nakamoto, by naming one of the songs in the album after him. For him, both of these domains go beyond their original function. Music has the capacity to change lives "the way that science changes lives when they invent prosthetic arms for people who have been amputated or born without an arm," he explains. That's why all of Gramatik's music is free to download online: "The guy who invented the cure for polio gave it away for free, he didn't want to patent it... If my music can inspire even one scientist to invent something that really helps mankind, then my mission here is done. I can feel like an accomplished human being." He may not have touched science yet, but he has definitely touched lives. Gramatik's fanbase has already shown eternal gratitude for putting his beats out there free of charge. Some fans even wrote to him–confessing the therapeutic benefits his music has had–and later donating money to the 'cause' after overcoming a difficult period in their lives. But where does this fetish for science and physics come from? Like many obsessions, it can be traced back to Gramatik's childhood. In a small town in Slovenia, called Portorož, the young boy grew up in opposition to religion. Although the country is mostly Roman-Catholic, his family is Muslim. "All of our grandparents are religious, and it gets diluted through generations. I feel like my parents were mostly religious to appease their own parents, who were blindly religious. And their parents even more [so]...". In speaking to his grandmother, he felt the generational gap. While she profoundly believed in Islam, the young Denis couldn't seem to wrap his head around it. "There's no proof for it... you don't have to provide evidence for a supernatural being that's supposed to be watching our every move from heaven, from a cloud? And he loves you, but he needs money?" he laughs, baffled. Science is his religion, and although he may be tempted by the idea of life after death, Denis prefers to keep his feet on the ground. The bell rings, and school's out. Two boys between the ages of 12 and 13 walk along the sidewalks of Portorož, with their hands in their pockets, wondering what to do. The small town bordering both Croatia and Italy doesn't offer many exciting prospects for the young teenagers. It's stale and picturesque. One boy turns to the other: "Hey, you know what? My brother has this software on his computer that you can make music on." And just like that, a door opens. Making music on a computer started off as a pastime for Gramatik, but quickly became his best kept secret. "We started messing around with early Cubease when my friend's brother wasn't home. If he knew we were touching his computer he would beat the crap out of us," he confesses. At first, the two boys mixed the sounds they knew best: hip hop. They started writing ryhmes in Slovenian, rapping over their homemade beats. It was a learning phase; digitally-produced music of high quality was few and far between, and Slovenian rap even more so. Denis comes from a working-class family. Before he realised he wanted to be a producer, and before he even had a proper job, he had to patiently beg his parents for a computer. The idea of being a self-sustaining artist was just that: an idea. "Coming from a small country, there are not a lot of opportunities. That, and not being from a rich family that can sponsor you and provide for you," these are few of the many hardships he had to face before coming out of his shell and tasting success. The more he understood his passion for music, the more he realised Slovenia was not the place to be. In 2011, at the age of 27, Denis moved to the land of dreams: the USA. "In America, the opportunities are endless," he explains, "that's why they call it the American Dream. Have you heard anyone saying they're living the European Dream? No!" But Denis has not lost touch with his heritage. Every year, the artist goes to Slovenia to play a gig. When his music first started hitting the charts, Slovenians were suprised to hear they had one of their fellow countrymen making it big in the States. But the internet knows no borders, and the fact that his music is online free of charge means that he can succeed on a global scale. "That inspired a lot of people. There are bunch of new producers in Slovenia that are doing really cool stuff, younger kids too, of about 16 or 17." The artist is taking them under his wing and launching some of their work on his label Lowtemp Music. Without even a hint of arrogance, Denis explains how it's inspiring to see such progession in his country, especially after the Yugoslav Wars. "There was a period of time where it was very hopeless in my region. We were a fresh democracy, Slovenia is only about 20 years old." Although he doesn't completely agree with the political shifts that have happened over the years in his home country, he is hopeful for its youth. "It's just endless ups and downs, same as what's happening in America right now. I think it's important to inspire young people to think outside of the borders of your small country." Time stops. Nina gracefully places her hand on Denis' arm to tell him there's only an hour left until his gig. "I only need 20 minutes to get ready," he replies breezily. The waiter passes by to see if everything is being taken care of. Adding to his previous thoughts on music, its capacity to change lives and the ample success of his beats back home, Denis continues: "I always say that if it wasn't for music, for film and art in general, I would kill myself." In many ways, music and science are what keeps him sane. Admittedly, though, having such a rational mind is not always the easiest thing. "I almost wish I was more ignorant because ignorance is bliss. I wish I could be that person sometimes... [but] music and art is what gives you some sort of relief. I'll stick around and do this for a while." For a while, or for life? "Life is only for a while," Denis concludes.